*Why do we say we use a Unified remote control system? 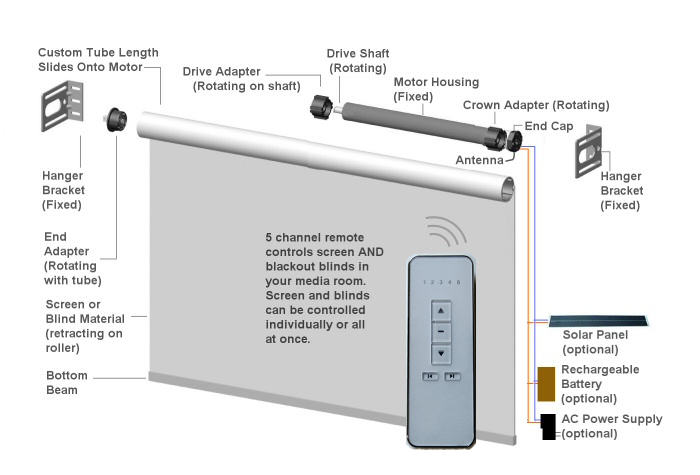 Because our BroadLink® automation hub can LEARN both radio (RF) remote control signals AND infra-red (IR) remote controls that are typically used with your TV and audio systems (see home theater phone app article series). This means you can say goodbye to that cluster of remotes you have on your coffee table! You can start with our simple hand held remotes to control our radio motors, and later add on a full home automation system for our radio motors, allowing control by any web enabled device (phone, tablet, PC, etc) - at home or away. Our high quality RollerTrol™ DC tubular motors for motorized shades and blinds with state-of-the-art remote control systems are precision engineered, safe for children and adults, and easy to install (see our battery operated motors). 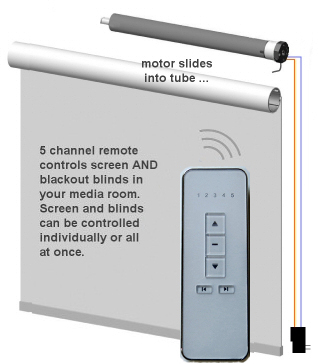 How about a Z-Wave and WiFi enabled slider control of blind, shade and window opener motors? You can also use your Z-Wave hub for voice control systems such as Alexa™ and Google Home™. Are you looking for a bottom-up shade or skylight shade? Check out our ShadeSlider™ motorized skylight shade and bottom-up blind system. This unit can also be operated with our Unity Z-Wave controller. At an average 38 db, our RollerTrol™ motors are among the quietest motors in the industry. Many other tubular motor brands are much noisier. The width is controlled simply by the length of slide-on tubing you select (minimum is 11", or 29 cm), and the height is controlled by the length of material you select (maximum motor turns is unlimited, unlike other brands). Different motor torque ratings are also available. many power source choices: A/C house current, battery, solar, etc. We guarantee our RollerTrol™ motors against defect for a full year. They have been factory tested to 30,000+ cycles (approximate life of 82 years at 1 cycle per day). If you use a battery in the system, they will work even when your building power has failed. You can use small high-efficiency rechargeable backup batteries that can be easily concealed, or you can use our motors with a built-in battery that is not connected to the AC grid, except during re-charge (solar optional). Use a 12v solar panel system, wind generator, water wheel or other 12v power source. These are very efficient motors that require very little power to operate, typically 5 to 10 watts for perhaps 30 seconds when operating. If you use the radio remote type, the standby power is approximately 60 uA for the radio receiver. If you want an AC grid powered system, just use our standard plug-in 12v power supplies. The battery is completely optional. You can make our RollerTrol™ motors do many different things. For example, see our article on how to make a motorized retractable skylight shade or window opener (linear actuator). Our multi-channel radio controllers can control groups of multiple radio equipped RollerTrol motors simultaneously, and you can also control them individually. Remotes can be cloned for multiple control locations. The BroadLink® RF-IR blaster automation unit is an affordable blind and shade hub, operated by Android and IOS apps. This device can learn RF radio signals for our blind motors and skylight/window openers and IR learning for TV. Convert old phones and tablets into powerful WiFi home automation controllers! We also have interfacing for all home automation systems via relays (see our blind & shade automation guide). Our RollerTrol™ RF radio type remote controls pass the signal through walls and have a range that can reach anywhere in a typical home. We currently we have hand-held remotes with up to 14 individual channels. There is no limit to the number of RollerTrol™ motors that can be set up in a group, provided you use a controller and power supply that can handle the load adequately. RollerTrol™ radio equipped motors use an electronic system set by activating a 'learn' mode with the multi-channel remote control, and the limits are set from the remote. You don't have to touch the motors at all. This is much easier than the old style with hard to access screw settings on the motor. The non-radio type of RollerTrol™ motor is set by activating a 'learn' switch on the motor itself, in conjunction with our low cost RF remote controller. This is still much easier and more accurate than the rotating screw system. The RollerTrol™ motors use an electronic 'pulse count' system, instead of the old style of screw adjustment mechanical limit system. Unlike these older mechanical designs, the number of rotations allowed is UNLIMITED.